Well, the last 2 weeks have gone by in a daze as I’ve been working close to 70 hours each week. As a result I’ve barely done a single hobby related activity. This Friday night I decided to forgo doing any work and made some movement trays for Kings of War. I cheated this time and used bases made by Warbases. 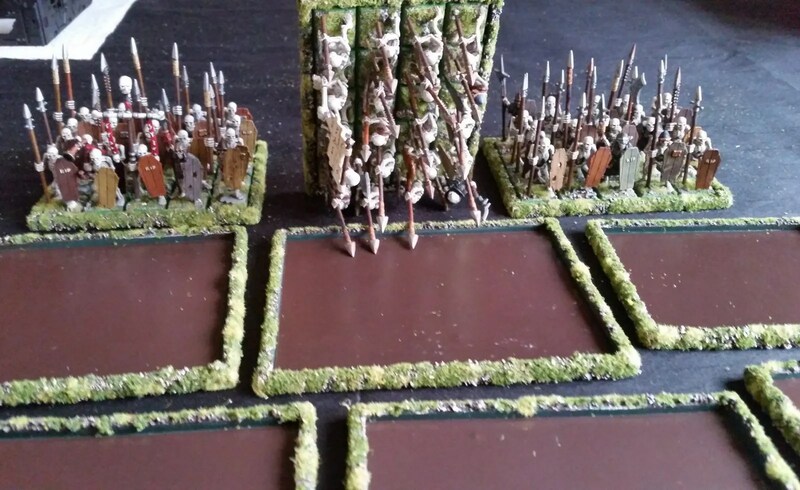 I ordered a batch of close order trays as by my calculations, they worked out just as cheap to have made and posted than to buy the plasticard and 3mm square doweling – not to mention the time It would take to build my own as I have in the past. I used PVA glue on the edges to get the sand/grains glued to it. Allowed it to dry, then repainted the edges with watered down PVA glue. Once this had dried, a swift paint job of dark brown followed by drybrushes of light brown, bone and white. I then glued on green flock and some static grass. Not the method I use much anymore for bases, but I had to make sure the bases matched the Undead models that were going on them that I painted back in 1999-2002. Most of the night was spent gluing small Neodymium magnets to the bases of my old figures and cutting sheets of 0.5mm self adhesive metal to fit the trays. I was happy with the result – the wife wasn’t – there’s flock all over the place. As you can see in the photo, the models fit the bases really well and the one sitting on it’s side show the models (even some of the old metal ones) stick to the magnetic base when turned upside down.